The picture was taken in late October 2011. This photo was taken in the lobby of a hotel near Dulles Airport in Virginia. I had just taken a photo of another object in the lobby and had turned to leave the Hotel. This table almost jumped out at me. 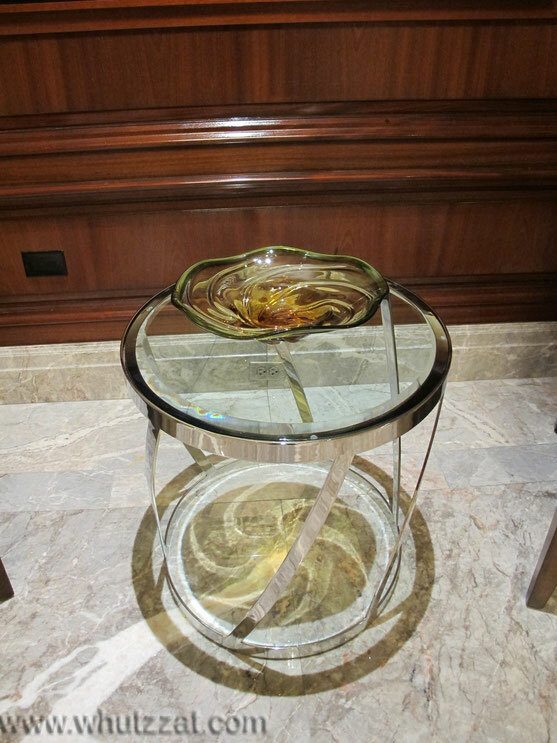 So strong was the impact of such a simple thing as the addition of a colored glass bowl to a very nice clear glass topped table that it was amazing. The only thing that seemed to be missing was a plaque to describe the contest for which it was being given. No mantle would be large enough to take it, it would stand alone, spot lit it would stun the observer. The After Take: Little changes each time I look at this. From the first time I saw it, I am left wondering how I might be able to duplicate the concept in my own home. I can see having a variety of colors available to bring change to the mood it brings to its location. Even some different bowl shapes might be interesting as well (I must say, the round bowl in the original photo is a winner). The marble floor must have honorable mention, the colors and patterns in it are very rich and set a tone for any application in which it is used. I love this table! I want one for my house.. The design it leaves on the ground is tite. I agree Jenna, its almost like a galaxy or something.